Swaziland, is an independent monarchy in southeastern Africa, bounded on the east by Mozambique and on the southeast, south, west, and north by South Africa. It covers an area of 17,363 sq km (6704 sq mi). about the size of New Jersey. Swaziland is roughly oval-shaped. The elevation of the land decreases from west to east. The mountainous western portion in places reaches an altitude of more than 1200 m (more than 4000 ft) above sea level. The hilly central region, or veld (grassland), has an average elevation of about 600 m (about 2000 ft). The eastern region, or low veld, is a rolling area that averages from 120 to 300 m (about 400 to 1000 ft) above sea level; it is bounded on the east by the Lebombo Mountains. The principal rivers are the Komati, Lusutfu, and Umbuluzi. The steady flow of the rivers, fed by abundant rain in the mountains, supports irrigation and hydroelectric power projects in the lowlands. Swaziland also has quantities of several valuable minerals, including coal, asbestos, diamonds, and gold. The climate is mostly temperate, with cool temperatures at higher elevations and more tropical weather in the low veld. Precipitation, which is heavier toward the west, is concentrated in the warmer months of October through April; the rest of the year is characterized by sunny, clear weather. The temperature in Mbabane, located in the western highlands, ranges from 15&deg; to 25&deg; C (59&deg; to 77&deg; F) in January and 6&deg; to 19&deg; C (42&deg; to 67&deg; F) in July. Nearly all of the people in Swaziland are ethnic Swazi, although there are small populations of Zulu, Tsonga, Asians, and Europeans. About 57 percent of the country's land has been set aside by the monarchy for exclusive use by the Swazi people. Much of the remaining land is owned by Europeans or foreign companies. The population (1997 estimate) is 947,456, giving Swaziland apopulation density of 55 persons per sq km (141 per sq mi). In 1997 the annual population growth rate was estimated at 2.0 percent. The capital and principal town is Mbabane (population, 1,986,38,290). Lobamba is the traditional royal capital. Some 32 percent of the population lives in urban areas. Traditional religious beliefs are held by about two-fifths of the people, and almost all the remainder are at least nominally Christians. The official languages of Swaziland are siSwati, a Bantu language, and English, in which most government business is conducted. In 1997 life expectancy at birth was estimated to be 40 years for women and 38 years for men. In 1994 some 192,600 children attended primary schools , and some 69,000 were enrolled in secondary schools. The University of Swaziland (1964) is in Kwaluseni. The literacy rate is estimated to be 77 percent. Swaziland's labor force is split between two dominant sectors, agricultureand services. Some 39 percent its workforce engaged in crop or livestock production, while another 38 percent hold service jobs. The country's economy is tied to that of South Africa through trade and currency links, and can rise or fall depending on the fortunes of its large neighbor. Gross domestic product in 1996 was $1.0 billion, or an average of $1130 per person. About three-quarters of the population live on Swazi national land, most cultivating staple crops of maize or herding livestock. The country's most productive farmland, however, are the tracts in private hands, which produce about 75 percent of the country's exports. Chief cash crops are sugarcane grown on irrigated land, cotton, citrus fruits, and pineapples. Livestock includes 650,000 cattle and 440,000 goats. Swaziland also has an important forestry industry. Much of the 146,000 hectares (361,000 acres) of forestland is devoted to production of pine. Because of a favorable climate, pine reaches maturity in Swaziland more than twice as fast as in Europe. Swaziland has large reserves of anthracite coal, which with asbestos form the country's mineral exports. Asbestos extraction has diminished in recent years because health risks associated with the material have decreased its use. Industrial diamond mining began in the mid-1980s. Much of Swaziland's manufacturing is related to agricultural and wood processing. 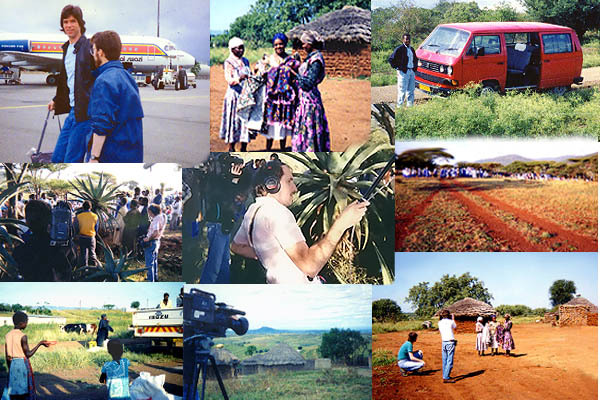 The tourism industry is growing; some 305,000 people visited Swaziland in 1996, attracted by the country's game preserves and mountain scenery. The principal exports are sugar, wood and wood pulp, canned and fresh fruit, and mineral products. Along with Botswana, Namibia, and Lesotho, Swaziland is a member of a customs union with South Africa, and the country is Swaziland's chief trading partner. The unit of currency is the lilangeni (plural: emalangeni), which is maintained at an equal value with the South African rand (4.30 emalangeni equal U.S.$1; 1996). Swaziland has 294 km (183 mi) of railroads, linking it to the ports of Maputo in Mozambique and Richard's Bay and Durban in South Africa. The road system extends 3810 km (2367 mi). The country's only large airport is at Matsapa, near Mbabane. National executive power in Swaziland is vested in a king who appoints, and is assisted by, a prime minister and council of ministers. One house of parliament is the National Assembly, which has 65 members, 55 of whom are directly elected from a list of candidates nominated by traditional local councils or directly elected and10 appointed by the king. The 30-member Senate includes 10 members who are elected by the National Assembly and 20 who are appointed by the king. Judicial authority is vested in a high court and subordinate courts. Civil matters among Swazi are handled by traditional leaders, subject to appeals to the High Court. /// Intresetingly, Swaziland's king has a striking resemblence to "Willis" from the TV show, "Different Strokes"
Under the leadership of Sobhuza, the Swazi retreated from Zulu attacks into the area of Swaziland about 1820. When European settlers entered the area during the 1880s, the Swazi granted concessions to them that endangered the independence of the territory. An Anglo-Boer convention of 1894 placed Swaziland under the administrationof the Union of South Africa (now the Republic of South Africa). Administration passed to the British governor of Transvaal in 1903 and to the British high commissioner for South Africa in 1907. In 1967 Swaziland became internally self-governing. The nation attained full independence on September 6, 1968, with King Sobhuza II as head of state. The king suspended the constitution in 1973 and banned all political activity; under a new constitution, promulgated in 1978, a bicameral parliament was indirectly elected. Following the death of Sobhuza in 1982, a power struggle ensued to determine which of the king's wives would rule as queen regent and which of his many sons would ascend the throne. In 1986 Crown Prince Makhosetive was installed as King Mswati III. Shortly after assuming the throne Mswati consolidated his power by abolishing the Liqoqo, an advisory body that traditionally gave binding suggestions. During the late 1980s and early 1990s members of organized political parties, which are illegal under the Swaziland constitution, secretly criticized the king and government. Their continued call for more accountability in government led Mswati to open public dialogue on changes to the political process. As a result of this dialogue, a majority of the National Assembly was directly elected for the first time in 1993. In 1994 the king authorized a commission to draft a new constitution incorporating the new election process. &COPY Microsoft Encarta Encyclopedia. All rights reserved.